Whenever there is an injustice in the world it is only natural to look to the highest authority figure in the land for a little assistance. Governors have been known to commute sentences; presidents have granted pardons. While a governor's pull is limited to in-state affairs there is no power greater than that of the President of the United States (except maybe Tim Tebow). So when the fans of the once proud Auburn Tigers and Ohio State Buckeyes were not sure who to turn to with their problem they went ahead and shot for the top—President Barack Obama himself. 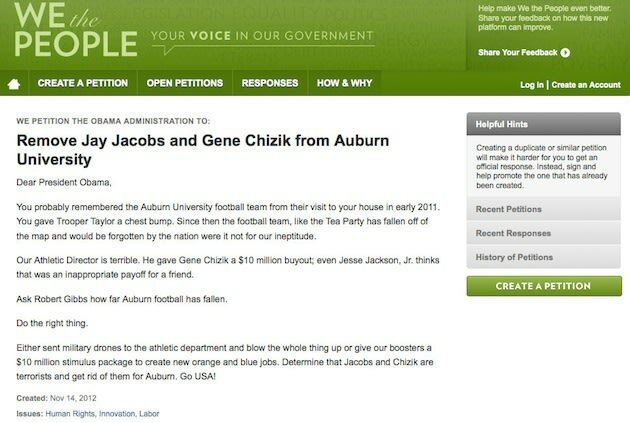 Auburn fans recently put up a petition online asking for the President to either blow up the athletic department and/or have head coach Gene Chizik and AD Jay Jacobs fired. It is unlikely that Obama will get involved since all the fans need to do is wait another week. After Alabama tears them a new one in the Iron Bowl there will be no need for the Commander-in-Chief to flex his muscles. Only a handful of people signed the petition anyway. Ohio State fans may have an argument though. Their petition has asked President Obama to step in and lift the post season ban on the team. Now the program did commit a number of infractions that require restrictions or punishments of some kind. However, the punishment is being levied against innocent parties. The Ohio State University football team is one win away from an undefeated season. However, due to imposed sanctions, they are not allowed to participate in their conference's championship game or the following bowl season. While a punishment for past indiscretions is to be expected, a bowl season ban is too harsh for a few young men trading memorabilia for tattoos and some change. The offending players and coach who covered it up are no longer part of the program. Please exercise your executive power to pardon the NCAA's excessive sanctions placed on The Ohio State Buckeyes to enable a rightful, satisfying culmination to the college football season for the American people." The author has a point. The guilty parties are gone. None of the people currently involved with the program have done anything wrong yet they are the ones that are being punished for the crimes of guys long gone. People that did not do the crime are doing the time. In a country where justice is supposed to matter and the innocent are not supposed to pay for the evil deeds of others, the punishment being laid down on the 2012 Ohio State football team is the text book definition of injustice. To compound the issue, the exclusion of the OSU appears as if it could impact who wins the national title. The team is currently No. 4 in the AP poll and after finishing the regular season undefeated (after they beat Michigan this weekend) could easily be in the No. 2 slot. They probably should be over Alabama and Georgia anyway (who both have one loss). College football has been dying to crown a true national champion. Keeping Ohio State out of the running will forever leave an asterisk next to the name of the team that does win it this year (since the two best teams will not have played). Kylie Jenner Running and, Um, Running in L.A.